A group of Christians coming from different backgrounds, confessions, Churches and denominations are pushing for one date for Easter. The people behind OneDate.org are aiming for something small but hardly significant, so that all Christians may at least give common witness to the resurrection of Christ. The website offers some thoughtful insights as well as the historical background concerning the different dates used by the Church in the East and in the West. Well worth a look. On the other hand, what divides us can bring one to tears, particularly in light of how petty it all looks when you consider the gravity of division's affront to the Lord's will, and when you think about how small those nitpicks look when compared against the mountain of common Christian witness. Not to say that those differences should be swept under the rug; this cannot be done because we serve the Lord who is Truth, and cannot thereby lie about the differences. But neither is it proper to treat other sincere Christians as enemies. There is only one real Enemy here, and, boy, is he pleased with the fruits of division: pride, paranoia, pharisaic tendencies, enmity, rudeness, polemics, hatred, in-fighting, contrariness -- all of which pervert the Church that Christ built. As an Anglican bishop teaches, (among other things) baking your own bread at home (which I do most days) has its advantages. Apart from saving money and providing freshly baked bread, there is in the baking a sense of relaxation, of having accomplished something tangible -- especially if I bake in the morning (the Filipino pan de sal today). "Ms. Vosper has written a book, published this week – With or Without God: Why the Way We Live is More Important than What We Believe – in which she argues that the Christian church, in the form in which it exists today, has outlived its viability and either it sheds its no-longer credible myths, doctrines and dogmas, or it's toast." And so continues the scattering of those who refuse to gather with the stewards (faithful or not) who were told: "he who hears you, hears me; he who rejects you.." and so on..
Anglican bishop says "Heaven is not our home"
Somewhat disturbing. He may be on to something when he points out how we are not to ignore the needs of the present in this world, but it seems to me that his conclusions go too far -- and off the edge of orthodoxy. I don't know about the actual book he wrote, but this article, which I assume to be a summary of sorts, does not seem to mention the book of Revelations at all. Now that's very odd if you're talking about last things. Msgr. Cormac Burke tackles the popular notion of self-esteem as espoused in western society today. I am not yet done reading, but what I've read so far is rather insightful, and probably quite apt. 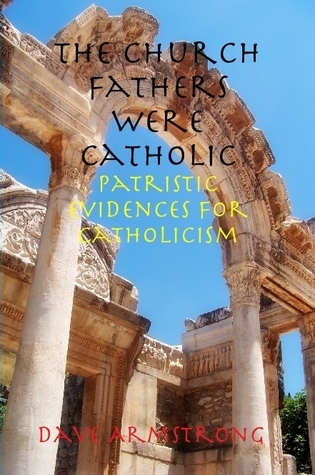 Dave Armstrong presents his latest book on the Church fathers. Click on the cover page graphic to take a closer look. Dave is one of my all-time favorite blogger-writers. He is particularly thorough and rational in his apologetics, and I must say that he has exploited electronic media well: he sells his works online -- which means a convenient and quick turnaround of requested titles. Visit Dave's site for great writing in electronic form, such as his bargain of $15 for eleven e-books. The book in the graphic is available in print or as an e-book via the Lulu Marketplace. Calling off the global warming panic? This is good news, or it should be for most people. For others, they'll have to find something else to panic about. Something in Catherine Deveney's rant in The Age about Easter struck me as a little funny. No, I don't mean that this comedienne who refers to herself as Catholic actually delivered a good joke. She prophetically said something that turns out to be rather funny. Early on, she claims that "Easter's never really taken off. Two thousand years and it's still the B team of religious celebrations." That certainly was a gaff for a Catholic to make, but I'm glad that I encountered it, since it elicited some rather good insights. I pray that other readers made the same connections. Mass is a big thing among Catholics. It is an ever-present requirement for Catholics to celebrate the Eucharist each Sunday, and a handful of major feasts during the year. Mass is also the singular vehicle of Catholic prayer, including weddings, funerals, ordinations, thanksgiving, and petitions. And yet each and every Mass revolves around the Eucharist: the consecration of bread and wine which are transubstantiated into the very body and blood of our Lord. At the very heart of this mystery is, no surprise here, the paschal sacrifice: Christ on the cross, once for all made, which elicits a major annual celebration during, no surprise again, the Easter Triduum. What of baptism, the first of sacraments? It is indeed an Easter sacrament, for in the waters of baptism, as Christ dies, we die, and as Christ rises from the dead, so do we. And let's not forget the very aspirations of Catholics, in taking up our daily crosses and dying to ourselves and to sin, for hope in Christ's promises of, no surprise again, our resurrection. So although we Christians are wont to lose sight of the big picture, Easter is an opportunity to reaffirm, in faith, hope and love, what we believe, although it should not occur only on this occasion, but in every single day. But in a special way, Easter connects us to what the Lord has destined us for, and it connects our every celebration of the Eucharist. It is thus with confidence that we can assure Catholics who see nothing spectacular about Easter: it is most spectacular, in fact. Just take a closer, more prayerful look. The Lord has truly risen: Alleluiah! And the scribes and the Pharisees bring unto him a woman taken in adultery: and they set her in the midst, And said to him: Master, this woman was even now taken in adultery. Now Moses in the law commanded us to stone such a one. But what sayest thou? And this they said tempting him, that they might accuse him. But Jesus bowing himself down, wrote with his finger on the ground. When therefore they continued asking him, he lifted up himself, and said to them: He that is without sin among you, let him first cast a stone at her. And again stooping down, he wrote on the ground. But they hearing this, went out one by one, beginning at the eldest. And Jesus alone remained, and the woman standing in the midst. Then Jesus lifting up himself, said to her: Woman, where are they that accused thee? Hath no man condemned thee? Who said: No man, Lord. And Jesus said: Neither will I condemn thee. Go, and now sin no more. The "aha" moment was not about the Lord's brilliant answer to the scribes and Pharisees. It was when I considered both how the Law of Moses did indeed prescribe capital punishment and how the Lord showed the woman mercy. It's easy enough to thus conclude that the Law of Moses was mistaken, but crashes into the wall of the Law being both inspired by the Holy Spirit and assured by the Lord's own words: "amen I say unto you, till heaven and earth pass, one jot, or one tittle shall not pass of the law, till all be fulfilled." (Matthew 5) Shocking as it sounds to 21st century Catholic sensibilities, there really is such a thing as mortal sin. But this is a death that the Lord does not take pleasure in, "but that the wicked turn from his way, and live" rather than die: for God is love. But the Lord is also just, and there is no other way to look at it: mortal sin is mortal, and that is the objective truth about the nature of mortal sin. However, Christ is the Father's mercy. In him, justice is not set aside, but he himself expiates for the sin. When he said "He that is without sin among you, let him cast the first stone," that, too is truthful. Mortal punishment is merited by mortal sin, but no more is such punishment ours to mete out. It is his alone, and in his mercy and love, he metes it out on himself on the cross. His sacrifice is all the more incredible when we truly consider how our sins nailed him to that cross, and that this horrible death was our just punishment -- except that he took them from us unto himself instead. And there is the "aha" -- and so we must pay earnest attention to our Lord's words to us: "Neither will I condemn thee. Go, and now sin no more." And in each mortal sin we commit, we must remember that the same death is earned, but the same mercy is offered to us, again and again. And if we persist in such sinfulness, how utterly ungrateful we are, and how cheap we make the sacrifice Christ made on the cross for us. Becoming then numb to the graciousness of this mercy, we risk scorning its worth in innocent blood, making us callous, devoid of gratitude and, in pride, greeting such mercy with contempt instead. Lord, may I never scorn your mercy! May I cling to your cross tightly, and respond to you in love -- then do with me as you will, only never let me leave your wounded side! There really is something to be said about these preparations that we make for Easter, as Malcolm told me earlier tonight before the Mass. The forty days in the desert of Lent leading up to the Triduum -- which I mostly squandered, sadly -- sometimes, we get in such a hurry to reach the goal that we miss out on the journey. Now I don't buy the idea that the final destination is insignificant -- by no means, if we're talking about our Heavenly home. We have to consider that both that destination and the journey are of God -- or at least, they ought to be, if we surrender all to him. Earlier I prayed the Stations of the Cross for the first time in many years. That was a journey too.. and knowing what we know about God's deliberateness in the Incarnation, as in the Passion, and in the mystery of our redemption, that cannot be an insignificant journey. And any and every part of Christ's journey from Bethlehem to Golgotha -- including such apparent side trips as the Last Supper? No accident either -- not by any means. So you think you can trust polls? This is rather funny. Mel Gibson's accent in Braveheart was voted second worst in cinema history, according to polls. What's funny is what is also revealed in the polls: several respondents nominated Sean Connery's accent as James Bond -- and their votes were disqualified since Sean is indeed a Scot. So why should we trust the results of the polls at all? What isn't funny, however, is how people actually do put a lot of stock on polls. The problem, of course, is that some things are based on objective facts, not opinion. Yet many serious matters of law, right and wrong, life and death, are affected by polls, despite the fact that it is always possible to manipulate polls. I remember this story coming out early last week, I think, about the Archbishop Paulos Faraj Rahho being abducted by terrorists, who also killed three men traveling with him at that time. And he's still being held for ransom, apparently. Prayers are still needed for his safe return. He is apparently ill and is in need of medication. Something else that cannot be left unsaid is that the mainstream media doesn't seem to care. Update:"Mosul, Mar. 13, 2008 (CWNews.com) - Archbishop Bishop Paulos Faraj Raho of Mosul, the Iraqi prelate who was kidnapped by gunmen on February 29, is dead." Requiem aeternam dona ei, Domine, et lux perpetua luceat ei.